There is something very engaging and personal about today's feast of the Triumph of the Cross. So many of us have experienced our own crosses, through illness or times of adversity, and have emerged, stronger, bolder, maybe even triumphant. It can be a profound experience of rising, and of new life; the transformation into beauty and hope of something filled with pain and memories of brokenness. But of course, the mystery which lies at the heart of this feast is about much more than the resilience of the human spirit. 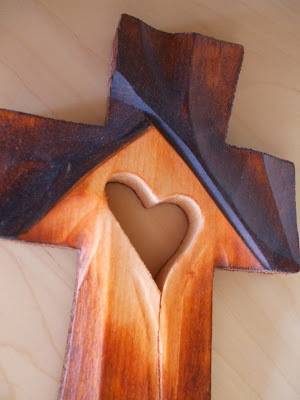 The triumph of the Cross is really the triumph of Love. This is a Love which, as today's second reading reminds us did not cling to his equality with God, but emptied himself (Phil 2.6-7), accepting to spend his final hours in vulnerability and powerlessness. This is a Love which seemed like a spent force, literally drained to the last drop... dead and buried... but which then rose, gloriously triumphant, not defeated but defeating death, and giving us the assurance of our own new life and redemption. This feast is welcome and lovely at any time, but especially so this year. The world is plunging into so much dystopian hatred, darkness and division, while those who sow this hatred, and abuse power - and people - seem to be unassailable and ascendant. Love and reason, compassion and peace can seem like small, feebly flickering, guttering candles, desperately trying to pierce through the encroaching darkness. So this feast is a timely, necessary reminder of the redemptive power of love, even - especially - when it appears vulnerable and vanquished. This ultimate, mysterious triumph of Love is - and has to be - the source and centre of our faith and lives, and of all that we dare to hope in.